Haven’t had enough of TAAFI? Feeling over-TAAFI-nated? (see what I did there?) Well, hang on for just one more second! Even though the festival is over, that doesn’t mean that our pals at TAAFI don’t have more in store for you. 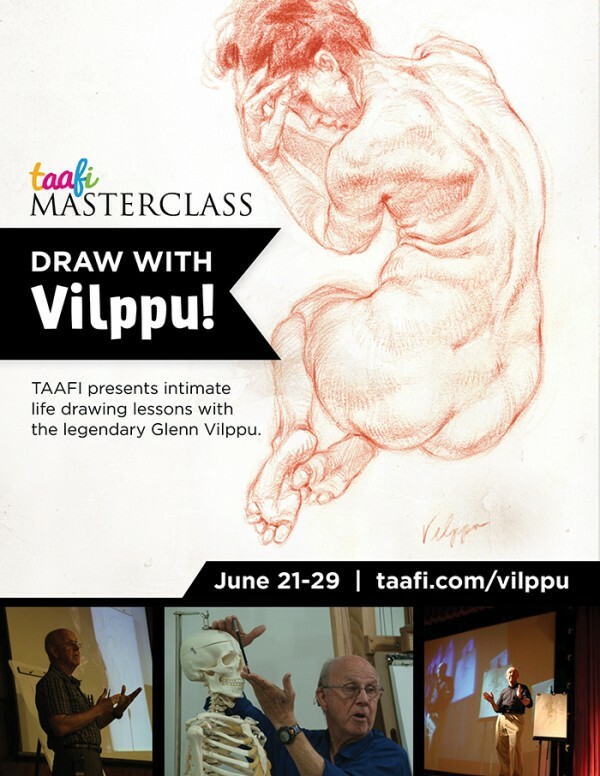 TAAFI is bringing world renowned artist and lifedrawing instructor Glenn Vilppu to Toronto June 21-29, 2014 to teach his signature method of drawing during a series of intimate hands on TAAFI Masterclasses. An early online education pioneer, his has trained countless students across all corners of the globe both online via Vilppuacademy.com and in-person lectures and workshops across the the world and now he’s coming to Toronto! While Glenn’s method is ideal for beginners, he is also known as the “teacher’s teacher”. No matter what your skill level, you will find it very comfortable to be in this supportive, non-competitive environment.Take advantage of this once in a lifetime opportunity to draw with the master himself. Choose from two weekend workshops, two week long workshops, two lectures or all of the TAAFI Masterclass events during his week long visit. Glenn Vilppu is trained in the classical art of the Great Masters of the Renaissance, holding a BFA and MFA from the Art Center College of Design in Pasadena. He understands the fundamental language of drawing and has throughout his career strived to keep the Florentine School alive. Studying with him today is no different than it was studying with Michelangelo, Rembrandt or Leonardo. Vilppu does not teach a style, he teaches tools of communication and gives direction to acquiring knowledge. They’re offering a number of packages, including weekend workshops, weekday packages, and a lecture series. This is as close to a once in a lifetime opportunity as we get. Check it out. This entry was posted on Thursday, June 19th, 2014 at 10:57 am	and is filed under News. You can follow any responses to this entry through the RSS 2.0 feed.